This will be the final recipe in this series of posts, and you can thank my Mom for just about all of them. 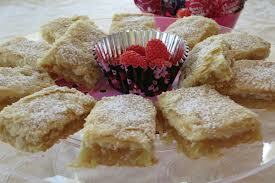 This one, Flaky Pineapple Squares, was found by her in the Boston Sunday Globe magazine. When, I’m not sure, but I’m told it was at the same time as the Minty-wiches recipe. This one is just as decadent and labor intensive as the minty treats mentioned yesterday. I think what I like best about these is that they are a great winter holiday treat as well as something you can bring to a cook out on the Fourth of July. The confectioner’s sugar and sour cream give the dough a light, fluffy, and melt-in-your-mouth texture. I’ve also made it as strawberry squares rather than pineapple and they are just as good! I hope you’ve enjoyed these recipes and stories. I’ll be on to a new theme in tomorrow’s post! Cut butter into flour, add sour cream and vanilla. Refrigerate for at least 2 hours. 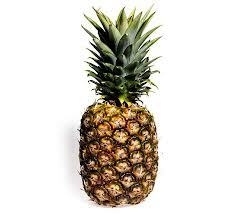 Meanwhile, cook pineapple, sugar and cornstarch over medium heat. Stir constantly until thick and clear. Pre-heat oven to 325º. Roll out 1/2 of dough and place in bottom of an un-greased jelly roll pan (we’ve used big cookie sheets or a half-sheet pan, and they’re just fine as well). Add cooled pineapple filling and spread over dough. Roll out remaining half of dough and cover filling. Bake 55 minutes or until brown. Sprinkle with confectioners’ sugar. Cut into squares when cool. Refrigerate if not used within a short time. * I have made this same thing using strawberries for the filling. Instead of 3 cups pineapple, cut up (at least) 3 cups of fresh strawberries, crush and cook the same ways as the pineapple above.